Buying the perfect gift can leave you in a dilemma we are far too familiar with. But we have had a beautiful box-shaped eureka moment! Be it a birthday, friendship day, Rakhi or just any milestone, the only common thread that runs through them, albeit difficult to weave, is a perfect, heartfelt gift. Here’s the fix! The curated gift box from The Style Salad, with different items for different occasions and looks absolutely exquisite too. They will save you the brainstorming and make it much easier for you to give your loved one the ideal hand-wrapped gift with a personalised feel! Step Up Your Game, Sister! Mix it up this Rakhi and gift your brother The Style Salad’s Hey Dude Box which is perfectly curated to your brother’s needs. It’s got a Bergamot & Black Pepper Shower Gel, a sleek leather key chain, a stylish passport sleeve and the traditional sweet addition to Rakhi, a hazelnut chocolate! Ditch the traditional route this time in favour of this. Boys, pamper your sister this Rakhi and gift her The Style Salad’s Pamper Box to show that you adore her! 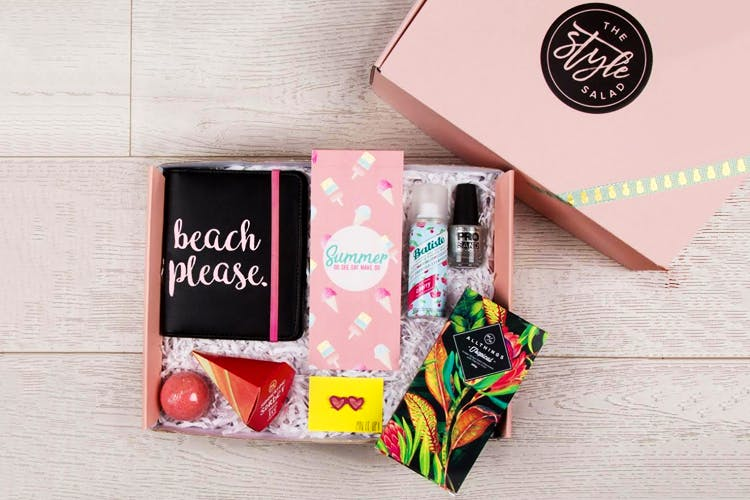 The box will help her have some well-deserved ‘me’ time because it’s got oh-so-soothing products! With stuff like calming blu cha tea, relaxing bath salts and jasmine aloe vera gel, your sister is going to have an indulgent spa day at home! It’s even got a Himalayan fruit & nut chocolate bar by Earthloaf which is your something sweet for Rakhi! Have a friend whose only constant in life is coffee? They Style Salad’s But First, Coffee box is going to make your friend feel super lucky to have you around! They’ve got a caffeine-infused body scrub, honey & hazelnut granola, parama luxury coffee blends & a Kathakali-inspired ceramic coffee mug all in a snug box which we assure you, your friend will love! The Style Salad’s Morning Sunshine box is a no-brainer to make your partner feel special. Undoubtedly breakfast is our favorite meal and this box has got such nice goodies that make us go WOW! It’s got pancake mix, premium filter coffee, homemade strawberry preserve and granola crunchers that make the perfect ingredients for breakfast in bed. Get this box now so that you that you can have brunch in style! If all these options don’t seem exciting enough for you, don’t fret! You can even put together a box yourself and customise it to your needs! So be it whatever occasion or milestone, mix it up this time with The Style Salad. Check their website for more awesome stuff!